Ozzy Blackbeard: The two-for-one post No2! I seem to be going with the Tried 'N' True patterns lately, so following on from my first Two-for-one post, here's a second. First is Deer and Doe's Belladone dress. This is my third version (the others are here and here). I've nothing more to say about the construction (except that I finally conquered the bias tape! ), so let's talk about the fabric. Good grief, I love this fabric so much. 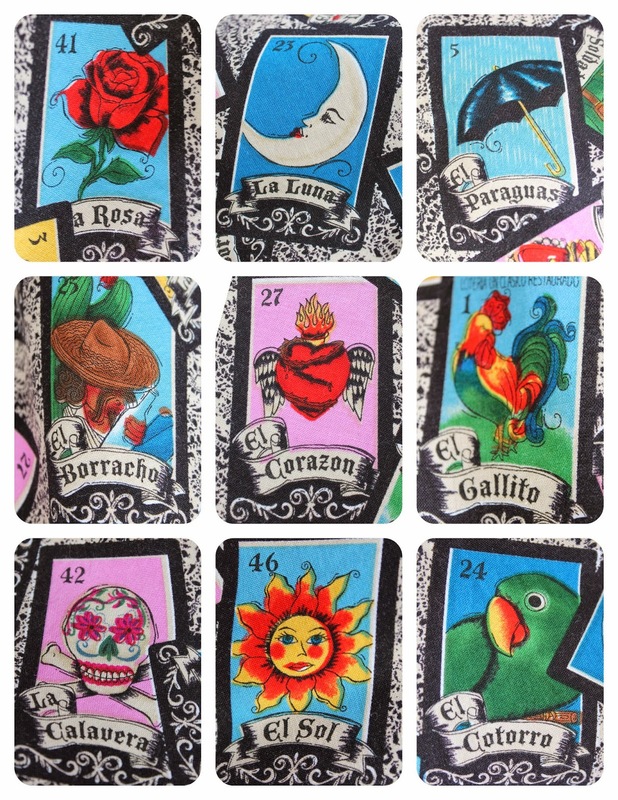 It's called Loteria, it's by Robert Kaufman, and it has Mexican tarot cards on it. There was a time when I would have been all over the Day Of The Dead fabrics, but not so much now, and this has the same feel to it but without the creepiness. I got it from Fondant Fabrics, it was £12 per metre and I bought 2.5 metres. I first came across this here on Nicole Needles blog; I was doing my usual blog reading while having my breakfast, and nearly choked on my Shreddies when I saw the fabric. Then I spent the whole day at work thinking about, and ordered it when I got home. I thought you might like to see all the cards in close-up. See what I did on the shoulders? A devil on the left shoulder, and a lady on the right! I had that idea when I was walking into the gym. I know the lady should really be an angel; but as there wasn't an angel, it was between her and the mermaid. Then I remembered that mermaids lure sailors into the sea, and that didn't seem very nice, so I went with the lady. How good am I at overthinking?! I added some piping to the waistband to break up the print, but the piping and an invisible zip were most definately not a match made in heaven. I can't remember how many times I unpicked this! I absolutely love this dress, and Belladone is such a great pattern. I even have a Pinterest board of my favourites, and Tabatha from Thread Carefully was kind enough to feature my first Belladone in this post this week. I shall look forward to seeing how her dress turns out. My second make is the Sassy Librarian Blouse. This is also my third version (one and two are here and here). 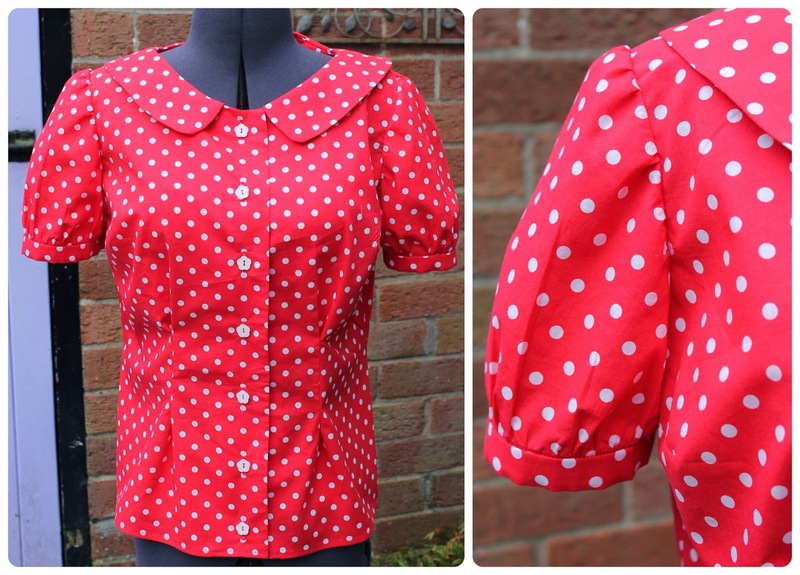 The only difference on this one is that I shortened the sleeves a bit. I did take some photos of me wearing it, but they were not good! I really did try to remember to take some more, but didn't get around to it. The fabric is some cotton lawn from ebay that was left over from my Dolly Mouse dress. I made this about two months' ago, and I really don't care that it makes me look like Minnie Mouse! I hope everybody in the UK is enjoying the nice weather at the minute; although I'm wilting a bit. 20C is about my limit, but it's lovely to see the sun shine, and my cotton dresses have been great to wear in the heat. Ooh what a coincidence! Love your third version. The fabric is ace! I finished my first Belladone last night, hoping to get photos tomorrow and blog it asap! Thank you! Looking forward to seeing your Belladone now! Thank you! I've worn that blouse so many times already! The fabric looks brilliant, and I love the devil/angel shoulder placement! Thank you! I'm pleased with how the shoulders turned out, and thanks for the fabric inspiration! Thank you! I thought the shoulder placement was good fun. Thank you! Belladone would look fab on you, it's a pattern that seems to suit everybody. Such a great dress! The shoulders are spectacular too. I can just imagine you waiting in line somewhere and the person behind you absentmindedly looking at the amazing print and then realizing you have a devil and an angel-like-being on your shoulders! Thank you! I hadn't thought about that with someone standing behind me. I so hope that happens! Thank you! I'm not really awake yet when I'm having my breakfast, so it's always a danger! Ahhhhh love the Belladone!!! So cute!!!!! Thank you! I just think this pattern is great. I love your spotty blouse! Thank you too for the link to that fabric shop, I might be about to make a purchase or two! Thank you! Isn't that shop lovely? It would be easy to do some damage to the credit card on that website! 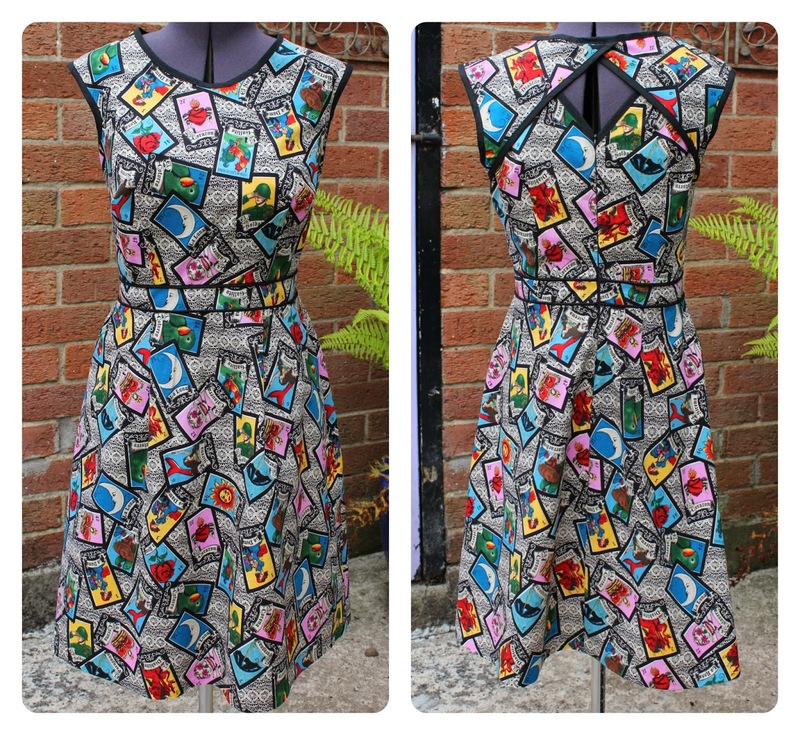 I really love all your versions of this dress, you make me want to make it! I bought it some time ago, and as soon as my weight stabilizes I'll make it too. 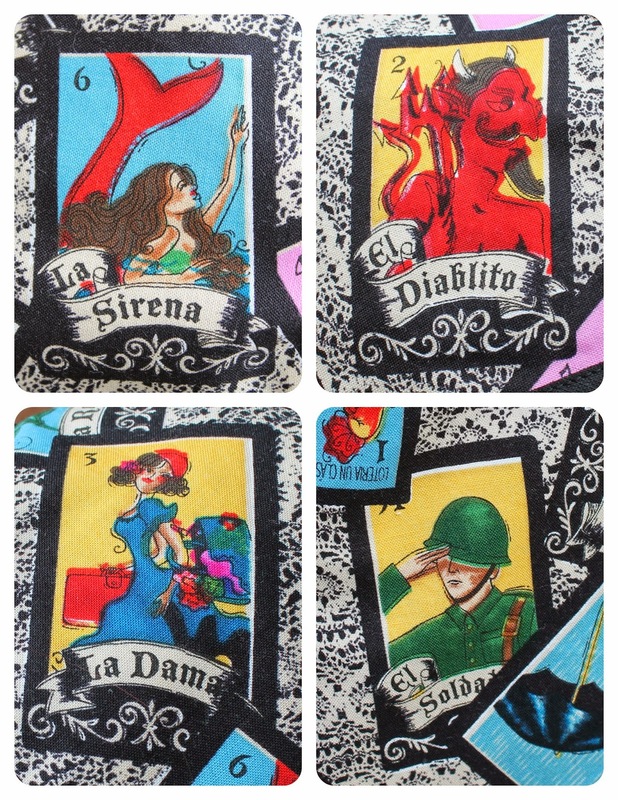 That devil/lady on the shoulders idea is a stroke of genius! That blouse will be so versatile. Red with white spots go with a lot! That dress is so great! ! !